The MSRB will host an education and outreach seminar on Monday, November 14, 2011 in New York, NY. The event will provide an opportunity for municipal market professionals to learn about MSRB initiatives and current rulemaking to protect investors and municipal entities. Local governments in the United States have been issuing municipal bonds since 1812. The City of New York issued the first general obligation bond. In recent months, many state and local governments have reduced the number of their public offerings, instead turning to alternative financings such as bank loans and private placements of their securities with banks, also known as “direct purchases.” This is particularly the case with variable rate demand obligations secured by expiring letters of credit. 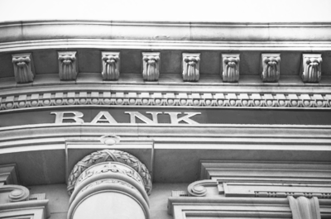 These alternative financings may, in some cases, be municipal securities transactions, triggering specific regulatory requirements. Market participants should be aware of this issue because they may have specific legal obligations to investors and issuers. On September 12, 2011, the MSRB announced that it would delay its municipal advisor rule proposals currently before the Securities and Exchange Commission (SEC). The MSRB was concerned that without a definition of who is and who is not considered a municipal advisor, some individuals would not participate in the SEC comment process on the proposals. Once the SEC has finalized its definition of a municipal advisor, the MSRB's rule proposals will be resubmitted to the SEC for approval. Edward J. De La Rosa, President and Founder of De La Rosa & Co.
Click here to see the full list of the members of the FY 2012 MSRB Board of Directors. 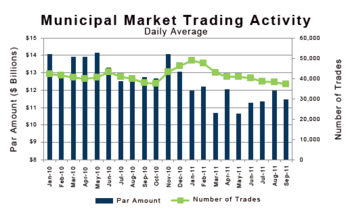 In September 2011, the daily average trading volume of municipal securities reached $11.45 billion, approximately 10.1 percent lower than the $12.74 billion traded in September 2010. Customer purchases accounted for 47.7 percent of all trades in September 2011, down from 50.3 percent in September 2010. Customer sales accounted for 32.2 percent and inter-dealer trades accounted for 20.2 percent. While 2011 total par amount traded through September continues to lag behind levels reached in 2010, the number of trades has increased. During the first nine months in 2011, $2.19 trillion changed hands compared to the $2.51 trillion during the same period in 2010. The number of trades in the first three quarters of the year increased to 7.91 million, compared to 7.65 million in the same period of 2010. For more information or other statistics on municipal trading activity, continuing disclosures or variable rate resets, visit the MSRB’s EMMA website. The MSRB published its first report summarizing the type and number of continuing disclosure documents for municipal securities available on the MSRB’s EMMA website. Update your subscriptions, modify your email address or stop subscriptions at any time by going to your Subscriber Preferences Page. You will need to use your email address to log in. If you have questions or problems with the subscription service, please contact support@govdelivery.com. If you have an MSRB Gateway account or are a regulated entity under MSRB Rule G-40 and wish to update your email address with the MSRB, you must do so through MSRB Gateway. For G-40 accounts, changes made to the MSRB’s email alert system will not satisfy your obligation to provide the MSRB with accurate contact information. Please note this message was sent from an unmonitored, automated email account. If you wish to contact the MSRB, please click on the below “Contact Us” link.